The hair is coming along nicely. Now that I've got the movement I want I'm going back and filling in the open areas and all should be well. I did take a break from hair last night and did more on the underside of the hat so I could determine if I need another row of hair to cover that small bit of yellow that is showing so we'll see when I get there, hopefully today. Over all I'm very happy with how this is taking shape, much better than my bullions that I was so excited to try. Stolen from Ali B Who I believe got them from San. As I don't always share a lot about me on here I figured this would be a nice change. 1. How old were you when you started cross stitching? After mulling this over for some time I finally decided I was 8 when my mom first learned and then showed me. 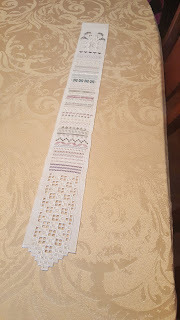 I was knitting basic things like wash cloths and potholders from age 5 or 6 but I never did anything related to cross stitch until 8. 3. What inspired you to begin cross stitching? I was 8, I wanted to be like mom :)She was learning something new and I didn't want to miss out. 4. 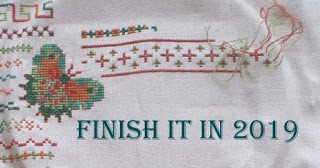 What has been your most difficult cross stitch piece? I can't honestly pick one that was more difficult than another. 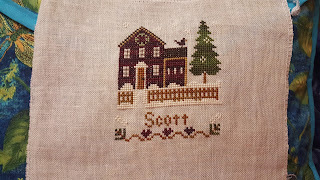 Some have been harder to stick with for the simple reason that once I got the hang of cross stitch I found doing pieces that were exclusively cross stitch boring. I like variety in the pieces I work on and the variety of techniques. 5. Do you have friends that stitch? I have several through the Embroidery Guild and Needlepoint guild that I've joined in addition to the many people I've met on the internet. 6. 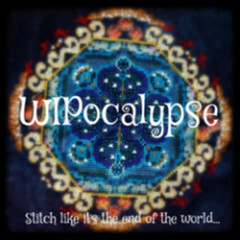 What is your favourite stitched piece? Earthdancer, my one big finish that took so long I can't help but be proud to have her as a finished piece. 7. What is your favorite fabric? Even weave. I love linen of most any kind as long as its not so stiff that it feels starched. Aida has never been something I've enjoyed stitching on, even back to when I first learned, I hate the fact that the squares to stitch on seemed to jump out at me, linen always looked more like it was done on regular fabric, more like traditional embroidery. 8. What is your favorite fiber? I have 2 actually. The first is a new one, Soy Luster. 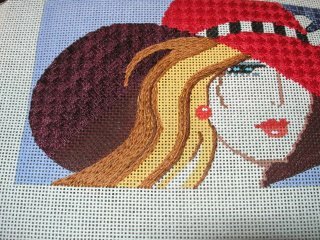 Its been a joy to work with on the Red Hat Lady. It lays nice and has a wonderful sheen. The other is Kreinik, yes I'm serious. I love what Kreinik braids and filaments do for stitching. No the blending filament is not the most enjoyable thing to work with but the little bit of sparkle it adds to a piece is worth every bit of it. 9. What is your favorite needle? Any needle will do but I do try to pick up gold ones if I see them. I'm very hard on needles and they seem to last a bit longer for me. 10. Do you prefer black & white or colored charts? Black and white. I like to make a photo copy of my chart and draw/highlight as I go to keep track of what I've done. Even with a color copy of a colored chart thats hard to do as you can't see the markings you've made through all the color. 11. How many Works In Progress do you have at this time? Too many? :) Actually there are only 10 which for me is pretty good. The problem being too many projects that I have to work on at home so they are not moving as fast as I'd like to get that part of the list down. 13. How many cross stitch charts/kits/mags do you own? Oh no... I knew this one was coming. I have *clearing throat* 197 charts, 14 painted canvases, 38 books with assorted designs I want to do, 45 projects from magazines (I've since recycled the mags)along with numerous freebies that fill 2 3-inch binders, appx. 50 Issues of Inspirations and Embroidery & Cross Stitch each with atleast one thing in each I want to stitch. Then there's the knitting, a 3-inch binder of patterns and another of magazines. I'm sure in my move I'll find a few more things I didn't know I had. 14. How much fabric do you have in stock at this time? Very little. I keep smaller pieces for ornaments and smaller projects and I have a few larger pieces that I've purchased for specific projects. I don't stash fabric as a general rule for the simple fact that I've had problems with fabric fading when its stored too long and I worry that I'll find the perfect fabric and the piece won't be large enough and I'll have to buy more anyway so I usually buy my fabric as needed. 15. Where is your favorite place to stitch? My living room, either my sofa or my recliner. I prefer working in a stand by far over stitching at a table. Its nice to have all my things infront of me as I work but I find I get physically tired from leaning over my work. 16. What is your favorite time of day to stitch? Evening. 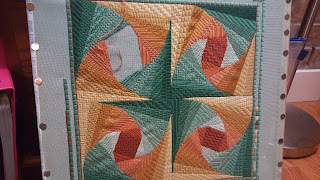 Its relaxing to do and its nice to have a movie or show on and work on my stitching. 17. How many pieces have you stitched in your lifetime? Approximately 110. As I said when I answered this question in the SBQ a few weeks ago that is a count of the ones I can recall. I'm sure there have been a few others but its been so long I can't remember. 18. Do you give your stitched pieces away? Seldom. I got snagged with too much gifting with my stained glass and right now of the 50+ projects I completed I have 3 in my possession. I'd make things and family/friends would actually try to "put their name on it" because they wanted it when it was done or they'd buy me a pattern and give me glass and ask me to make it. I also know that many of the people I know don't understand what I do so they would have no realization as to how to take care of it. I'm making a blanket for a friend who's expecting and I'm taking every measure to make it something that will be easy care so she can actually use it without me cringing that it will get ruined. 20. How many pairs of scissors do you own? Oh no, another one of those. Actually its not too terrible. I have 15 pairs including specialty scissors for hardanger and metallics. etc)? Stitching enhancers? That is an interesting way to put it LOL I have a light just so I don't have to have my whole living room bright as noon day sun and I can still see to stitch. I do also use scrolls for my larger pieces so I can use my stand to work on them. My needlepoint I usestretcherr bars to keep tension on the canvas which reduces the amount of blocking needed. 23. Do you have a craft/stitching room? Sort of. Right now my living room is my craft room. Its just me where I am so I do as I like. :) My stash is a bit scattered though as there is only so much room. Where I am moving to there will be an office/craft room that will have my stash organized in the nice large closet and my sewing table and a bookshelf well occupy one wall of the room with the computers on the other side of the room. 25. 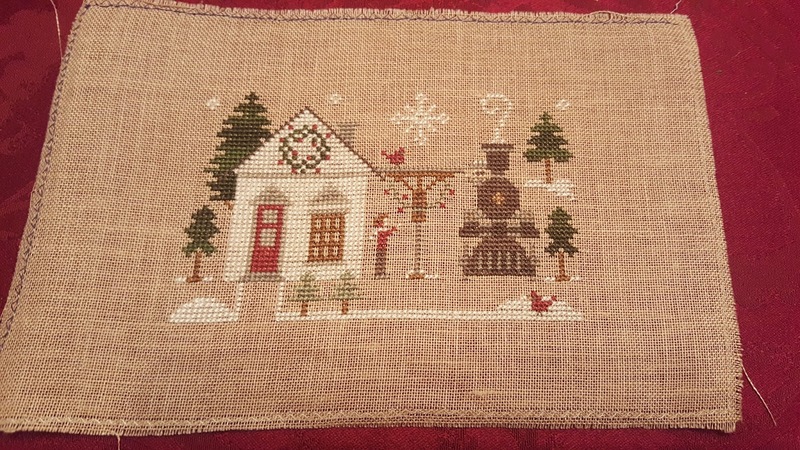 What is your most memorable time related to cross stitching? Going to the EGA National convention in 2000 with my mom and aunt. It was at Disney that year and we all got in the same class on Stumpwork. We had a fabulous room that had a small kitchen so we didn't have to eat out all the time and we spent our lunch hours and evenings out on the patio stitching together. You only have 8 in the pile? You are a finisher, my friend. I refuse to count, but it is WAY more than 8.